Rashmi Krishnan is currently a Security Architect with Visa, where she focuses mostly on network and cloud security initiatives. With past experience in OpenStack Barbican, Rashmi has also worked in software engineering as well as with wireless network security. Rashmi has a bachelor degree in Computer Engineering, and most recently graduated from Carnegie Mellon University with a Master of Science. 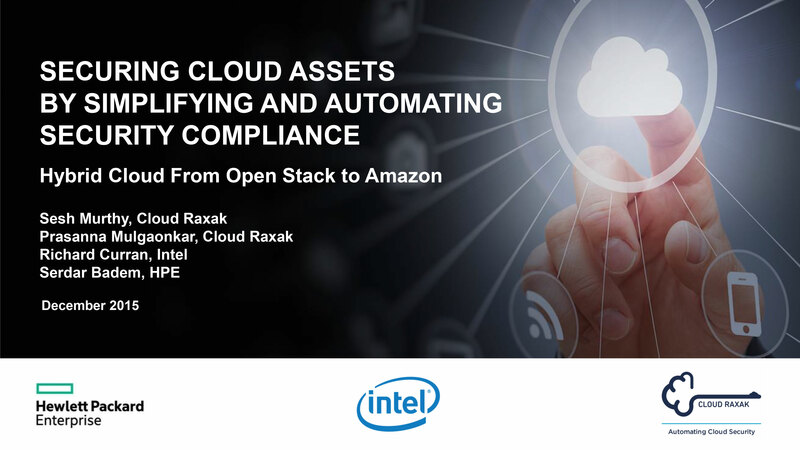 Raghu Yeluri is a Principal Engineer and lead Security Solutions Architect in the Data Center & Cloud Products Group at Intel Corporation with focus on virtualization and cloud security usages, solution architectures and technology initiatives. In this role, he drives security solution Pathfinding and development to deliver hardware-assisted security solutions that enable deep visibility , orchestration. 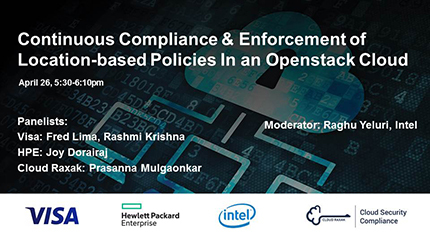 Dr Prasanna Mulgaonkar, the CEO and cofounder of Cloud Raxak, is an expert in computer security and compliance. He has spent the last decade working on security mechanisms that leverage the hardware root of trust provided by modern computing architectures. At Intel, Prasanna created the technology and led the team that developed and delivered Deep Defender--industry's first endpoint anti-rootkit product. Study after study shows that security is still the biggest barrier to cloud adoption, with compliance and data protection being two of the top concerns for the Chief Information Security Officer (CISO). Enterprises often have a need to enforce policies (based on data sovereignty requirements) that a virtual workloads can only be placed or migrated to specific geography location. Enterprises need to show the location of the server that the workload is running on, to satisfy the requirements of government and industry regulators. Some others want to launch VMs/Apps/Containers on Servers with Boot Integrity – Platform Trust, while some have a need to extend the chain of trust from platform to workload (VM/Container). 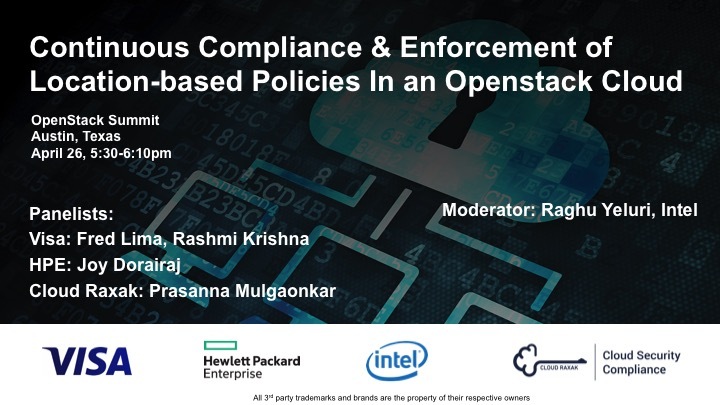 The session featured a customer case study from Visa with technologies from Cloud Raxak (RaxakProtect Security Compliance Platform), Hewlett Packard Enterprise (Helion OpenStack Private Cloud, Proliant Gen 9 servers) , and Intel (CIT, TXT and TPM). The companies demonstrated how Hardware Assured Security Compliance can enable regulated business in financial services, the payment card industry, and retail to achieve continuous compliance with Payment Card Industry-Data Security Standard (PCI-DSS).